What's the latest on "Quick Entry" solutions for TaskPaper 3? Returning to TaskPaper after some time away, I’m wondering what folks are using as a substitute for the “Quick Entry” dialog no longer available in TP3? I’m currently using LaunchBar’s “Prepend text file…” feature but I’d love to find something even easier. Anything using LaunchBar or KeyboardMaestro would be fine, but I’d like to have new entries automatically include the "- " prefix and end up in an “Inbox:” project in a pre-determined .taskpaper file. 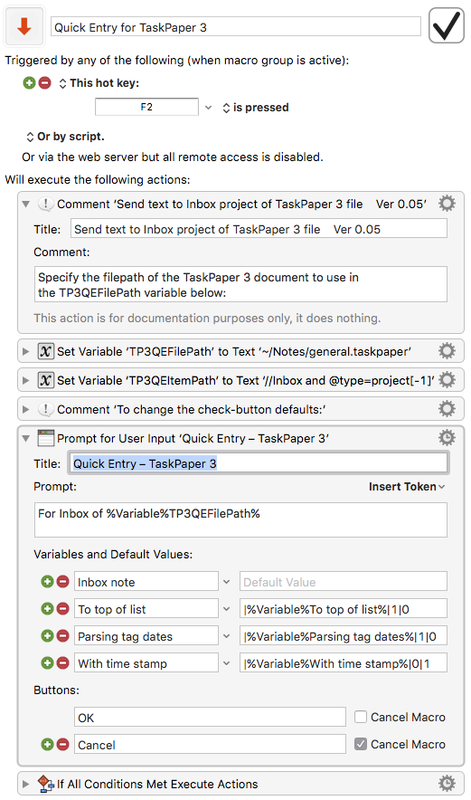 What's missing in TaskPaper 3 Preview? Making a start on that here – this version just takes its text from the clipboard, and puts it in the Inbox: project of the specified TaskPaper 3 file. This works great so far. Thanks! I designed it for TaskPaper 2, so you will need to update the macro to point to the icon of TP 3. Here is a shell script that I use with Launchbar that inserts new items at the top of the first project in the named Taskpaper file. It also automatically saves the file. As you can see this idea does not originate with me and I am grateful to Larry Hynes. All you need to do is save this as a text file with a .sh extension and make it executable using the chmod command, then create a Launchbar search template that calls this executable and you are set. Please note that one advantage of this script is that neither Taskpaper, nor the file it addresses needs to be open for it to work. The distinct advantage this affords is that you can add an item to your list (I have several different lists) through Launchbar without opening and getting distracted by anything else. Everything stays in the background. I’m a recent convert to TaskPaper and really love - the only thing I’m missing so far is an easy Quick Entry options. As I use Launchbar mostly I was searching for Launchbar Actions that could do it. Has anyone tried to adjust these actions to Taskpaper? I can’t answer if anyone else is working on porting these (I am not right now), but I can say that they should be very portable. FoldingText and TaskPaper have very similar scripting models, anything you see done in these scripts should be doable in a similar way in TaskPaper. Unfortunately it won’t be in the “same” way. 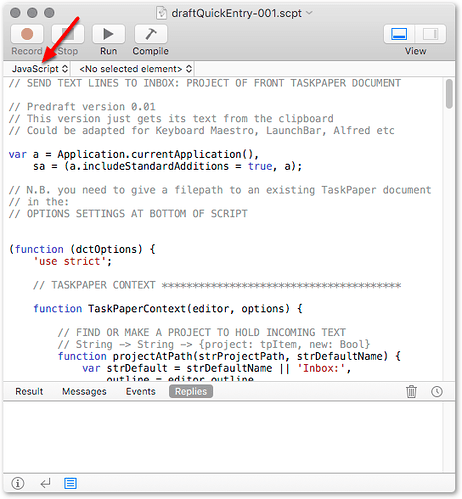 TaskPaper’s API function is very similar to FoldingText, but the syntax is a bit different. Here’s TaskPaper’s API docs. Thanks a lot for the reply - it didn’t look to complicated, but sadly I have no clue where to start. This is pretty easy using my TaskPaperRuby API, and you won’t even need to have TaskPaper running at the time (or even installed, I suppose). I use it with Keyboard Maestro. 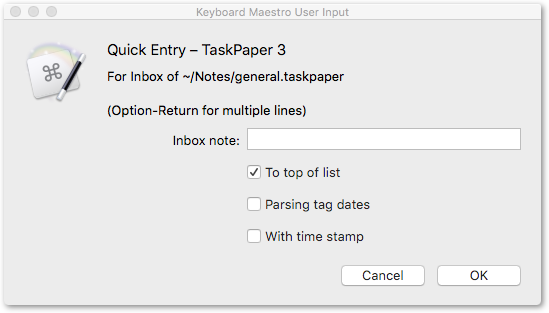 I have a “Prompt for User Input” action in my Keyboard Maestro macro that puts whatever the user enters into a variable called “taskpaper_task_text”. Then add an Execute Shell Script action to run the following script. Remember that you’ll need to have TaskPaperRuby installed somewhere, and you’ll need to put the path to your TaskPaperRuby installation into the configuration section at the top of the script, as well as the path to whatever TaskPaper document has your “Inbox:” project in it. puts "To create a new task, pass a quoted string as an argument." ruby add_to_inbox.rb "New task text here"
These solutions are good but what I would want to know is if Jesse is planning to add back this feature in the future. I think of this as a basic feature of TaskPaper which should be included. I would like to provide some solution to the problem of quick entry. But I’m not sure what I want it to look/work like. Anyway it’s on my list, but not something that I’ve yet started, and I’ve got quite a few other things above it right now. Maybe at some point in future, but unlikely in the near term I think. Right now my big constrain is time. @complexpoint I love this script! I’m using it with Alfred and it works great! Is there a way after the tasks are added to the inbox that your script could tell TaskPaper to do a “Save” automatically? Good idea. I’ve made an edit and uploaded a new copy to the Keyboard Maestro site. You can edit the value of a saveAfterAdding option to true or false.